If you haven’t heard about the Lynx Indoor 1080P Wifi Home Security Camera yet, it’s high time you checked it out. 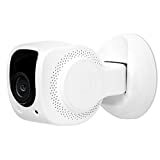 This nifty home security camera has all the standard features you would expect from a security cam, but it also has a special feature that’s typically reserved for high-price cameras like the Nest Cam IQ. While the IQ will give you cool facial recognition features for $300, the Lynx cam offers similar features and it’s on sale right now on Amazon for just $48. It uses facial recognition to differentiate between people you know and people you don’t, and it can trigger alerts or alarms accordingly.